Three of Tom Stoppard's plays reveal a deep fascination with physics. 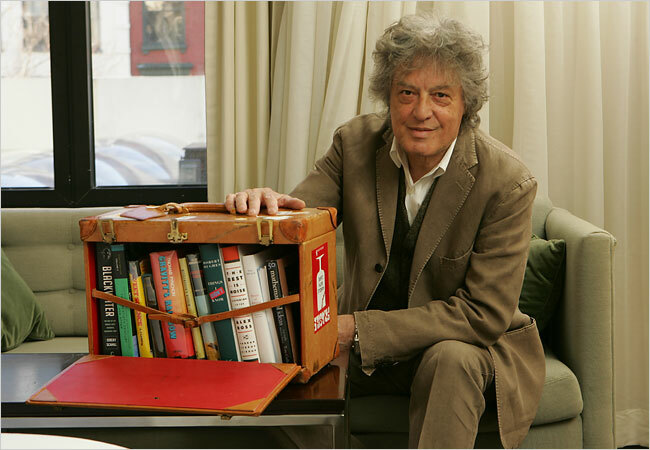 When it comes to writing about science, playwright Tom Stoppard is in a genre all his own. Stoppard, whom you might know as the screenwriter for the movies Shakespeare in Love and Brazil, wrote three plays he called his "physics plays": Arcadia (1993), in which a group of modern academics try to piece together the life of a young girl in the early 19th century; Hapgood (1988), about the fictional head of a top British intelligence agency during the Cold War; and Rosencrantz and Guildenstern are Dead (1966), in which Stoppard reimagines Shakespeare's Hamlet from the perspective of its two least important characters. But the plays aren't science fiction or physics edutainment, nor do they portray events from the history of science or depend on science to drive the plot. Instead, Stoppard masterfully uses concepts from physics to ask deep existential questions: who are we? Do we have free will? How do we find meaning in the short span of a lifetime? Brad Carroll, a professor of physics and chair of the physics department at Weber State University, created an entire course exploring the physics (he assigns a science materials alongside the plays) and philosophy in these three plays. Here's what he had to say about reading Tom Stoppard as a physicist and using his plays to teach physics to students from all disciplines. We start with a physics textbook, Seven Ideas that Shook the Universe. The wonderful thing about this text is that that the order of the ideas as they're presented are just the order that [the students] encounter the ideas in the plays. We talk a little about early Greek astronomy, all the way up to Kepler and Copernicus. Then we do Hamlet and Newton's Laws before Rosencrantz and Guildenstern are Dead. We do thermo, and then do Arcadia, then quantum physics, and Hapgood...I have them put on some of my favorite scenes in the play. It prevents it from turning into strictly a lecture physics course. The scenes are those that have good physics significance. What kinds of students usually take the class? It's usually not the physics students who are in there, which I'm happy about—they're going to be showing off that they already know this stuff. We've had English majors, theater majors, philosophy, manufacturing technology, just every part of the spectrum as far as disciplines. Is it more of a literature course or a physics course? I think I'm teaching both. I'm probably only qualified to teach one, the physics, but I hope they come out with an appreciation of literature and of how a good play is constructed. I've certainly had a lot of great conversations on the play and on the physics. I give them exams both on physics content and on the content of the plays. Rosencrantz and Guildenstern are Dead gets right into physics with the opening scene. The two are tossing coins, and they come down heads 87 times in a row. Yes, and Rosencrantz is not at all surprised by it, but Guildenstern is quite worried. It sets the stage, the suspension of the natural, right at the very beginning. Just like in Hamlet, where the ghost appears right away, the coin flipping is doing the same thing. It's showing that throughout play the laws of probability aren't working, free will isn't working. After all, all their behavior and actions are scripted in play Hamlet. What about the physics in the movie, which Tom Stoppard directed and includes a lot of impromptu physics "experiments" that the play doesn't have? Rosencrantz and Guildenstern have such different personalities. Rosencrantz uses inductive logic. He sees things and tries to form a general idea. Guildenstern uses deductive logic. Neither are very good at it. Rosencrantz sees an apple fall and he starts to get an idea about gravity, but he can't bring it to a general conclusion. Then there's five pots hanging in a row, he moves one back, it smacks the one adjacent to it, and the end flies out—it's a Newton's cradle. He goes to tell Guildenstern about it, lifts the pot and it swings back and hits the pot and breaks, and that lesson is lost. There's another scene where he nearly invents a steam engine with steam from a steam kettle, but Guildenstern will have nothing to do with it. He also finds that lighter objects and heavier objects drop at the same speed, but when he tries to show this to Guildenstern, he uses a feather as one of the falling objects and of course it doesn't hit the ground at the same time. There are all sorts of little references to physics in the movie. It just shows the failure of Rosencrantz to be able to complete the train of inferences that would lead to a general observation. "Syllogism the second: One, probability is a factor which operates Within natural forces. Two, probability is not operating as a factor. Three, we are now within un-, sub- or supernatural forces. Now, counter to the previous syllogism:...If we postulate, and we just have, that within un-, sub- or supernatural forces the probability is that the law of probability will not operate as a factor, then we must accept that the probability of the first part will not operate as a factor, in which case the law of probability will operate as a factor within un-, sub- or supernatural forces after all; in all probability, that is." —Guildenstern, pg. 17, Rosencrantz and Guildenstern are Dead by Tom Stoppard. Also poor Guildenstern just can't see the point of it. Guildenstern has a syllogism, a series of steps that proves they're not held within "un-, sub- or supernatural forces." But then he realizes he used logic which can't be trusted, because he can prove they are and prove they are not. Let's move on to Arcadia. What's there in terms of physics? It all centers on a young girl, Thomasina, who lived back in the early 19th century and who is ahead of her time. She's intuiting ideas about fractals, about chaos theory, about the laws of thermodynamics—she is seeing way ahead of her time. I remember there's a moment where she asks a question about entropy. Yes, she asks her tutor, "If you can stir into jam into rice pudding, why can't you unstir it?" She's thinking about the irreversibility of thermodynamics. She also thinks about fractals, complains to her tutor with something like, "God's truth, Septimus, if God can make an equation like a bell, why not a bluebell, and if a bluebell why not a rose?" She's thinking of the fractal nature of physical world. Finally, can you talk a little about quantum mechanics in Hapgood? Stoppard does a wonderful job with Hapgood, which is a spy story. [There's one character] whose name is Joseph Kerner. Kerner is not just a double spy, he works for both the KGB and the British Secret Service. He's beyond being a double spy, he works for both sides. He says even he doesn't know which side he's working for. He passes each side's secrets back and forth. But he always tells the truth...Kerner is of course a physicist. He says it's not necessary to know [who he's working for], he just passes information back and forth. He's like nature; if you talk about, are electrons waves or particles, the electron knows what it is, and always tells the truth. "We choose to examine a phenomenon which is impossible, absolutely impossible, to explain in any classical way, and which has in it the heart of quantum mechanics. In reality it contains the only mystery ...Any other situation in quantum mechanics, it turns out, can always be explained by saying, 'You remember the case of the experiment with the two holes? It's the same thing.'" —Richard P. Feynman, Lectures on Physics/The Character of Physical Law, quoted in Tom Stoppard's Hapgood. When we do experiments with the electron it can behave like a wave or a particle. When people ask Kerner questions, Kerner always answers truthfully, but how those answers are interpreted depends upon who's asking for them. Duality, the wave-particle duality, is a big theme. Stoppard has another theme for that play, which is that we all, within us, have our own dual natures. Stoppard says each of our characters is the working majority of a dual personality. The other part is there in a submerged state. Each of us have a dual nature...a side we express under certain conditions, a side we express under other conditions. Why do you think Stoppard has so much physics in his plays? Stoppard is not a trained physicist. He has no special training there; he studied it on his own. In interviews he's called these his three physics plays. They were something he felt like doing, but I've read other plays of his with a lot of philosophy in them, but perhaps not much physics at all. He says it was a phase he went through. Is there a general theme for all three plays? I think the whole arc for my course is the question of free will. How much control do we have over our lives? That's what Stoppard is really exploring, at least in first two, Rosencrantz and Guildenstern are Dead and Arcadia, because he's really interested in determinism and free will. His view of humanity's plight in Rosencrantz and Guildenstern is that we're like characters on the stage reading scripts, passengers on the boat being carried forward, but we're goin to where the boat is going. In Arcadia, Thomasina is trying to understand free will. She is delighted with not being able to unstir her jam because Newton's law says things go forwards and backwards in the same way by same law, but in her view, the laws of thermodynamics are different. There is an arrow to time, a direction to time, and this might throw a wrench into determinism. Near the end of the course, we read Feynman's lecture on Probability and Uncertainty from "The Character of Physical Law." Feynman concludes that the past does not determine the future, so "the future is unpredictable." The students find that although quantum mechanics does not explain free will, at least quantum mechanics makes it possible to believe in free will. Whether or not we have free will is still a matter of great debate, and the students enjoy voicing their opinions! Dr. Carroll in action, teaching "Physics in the Plays of Tom Stoppard." As an astronomer, how did you end up teaching a course on theater? The Honors Program had been after me personally to teach an honors course for some time. I'd always enjoyed Tom Stoppard's plays, and I had in my mind loosely the idea of doing a course on physics in the plays of Tom Stoppard, but wasn't quite there yet. Rosencrantz and Guildenstern are Dead is classical physics and Hapgood is quantum physics, but I didn't have a bridge in between them. Then I read Arcadia. I remember when I got to the climactic scene of the play, I realized Arcadia said everything that's important to me as a physicist and probably as human being. I knew then I had the course. Why did Arcadia have such a powerful effect on you? In the climactic scene of the play, the all-but-last scene...there's a conversation about how everybody's looking for something. One of the characters in the present day, Hannah Jarvis, says the theme: "Comparing what we're looking for misses the point. It's wanting to know that makes us matter." That resonates so strongly with people in physics and people in a lot of other fields. Do you think it's difficult to teach students physics by having them read plays? I think every college has a conceptual physics course that doesn’t require a lot of math, and so I don't think it's that much different. I use the same physics text as when I taught a conceptual physics course. I'm really trying to build a bridge here between the arts and the sciences, to show [students] that what we study in physics can have meaning for their lives. If you're going to talk about questions of philosophy you should really be formed about the physics that might be involved. You could very well be arguing about a world that doesn't exist. Why do you enjoy teaching this course? I'll say that this course has given me some of the very best teaching experiences I've had. At the end of the course everyone has to present a project. I don't care what it is, but has to be something that shows they took something from the course and internalized it and made it their own. I've had people write songs and poetry about free will, I've had people write children's books...just a lot of things. Somebody did country swing dancing, and as they did it, they talked about the constant conversion of energy between potential and kinetic energy...The presentations of those projects have been the best days teaching I've had at Weber State. Brad Carroll is a professor of physics and the chair of the physics department at Weber State University in Ogden, Utah. 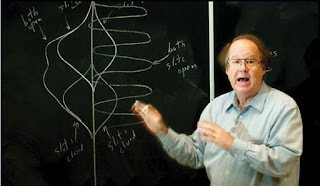 He has been teaching "The Physics of Tom Stoppard's Plays" since 1996. Most of his recent effort has gone into co-authoring An Introduction to Modern Astrophysics, now in its second edition. I love Stoppard plays. The great things about the movie version of R&G are Dead is that Stoppard directed it himself. So even though it's different from the play in many ways, it's just as good (some might even say better). Thanks for the great article and insightful interview with Carroll. I think I learned a little more about both literature and physics from reading it. Oh, please. Super Relativity is just a desperate attempt by people who believe in God to get a sense of determinism back into physics. It makes no new predictions and only serves to add a useless extra layer onto the Standard Model. It's de rigeur for fundamentalist Young-Earth Christians panicked over the fact that modern physics more or less flies in the face of an omnipotent God.